Discussion in 'Edged Tools' started by autodidact, Sep 1, 2016. I recently sent Rod Garcia a request to be put on his waitlist to the email listed on his website. While awaiting a reply, I noticed that the last update to his site appears to be from 2009. I am not in any kind of a hurry but was wondering if any of you guys know if he is still taking orders. If so, what is the approximate current wait time? Mr Garcia, if you are a member here and see this post, no offense intended. Just wondering. ArmyMacE, seasonofthewoods and backwoodstrails like this. It is an approximate 36-40 month wait. ArmyMacE, Badey and autodidact like this. he'll get back to your email in a month or two. 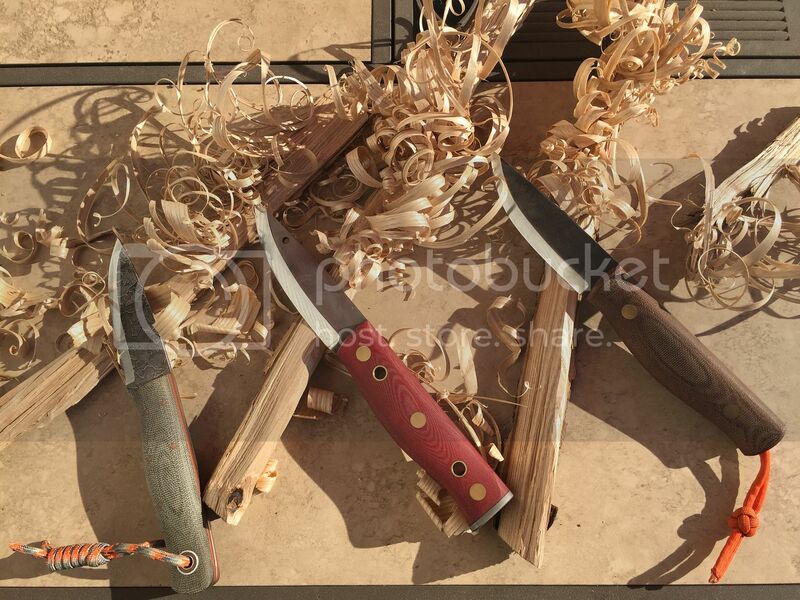 he is still taking orders, but appears to be busier building knives and living than updating his website or maintaining any sort of online presence. Dukejb and autodidact like this. Thanks for the replies. I am a patient man and empathize with getting the job done and putting family first. Just wanted to get an idea of what to expect. Mr. Tettnanger and the_dude like this. It would be much shorter to wait for one to pop up on the trade blanket. The Lagom Bush Knife is a nice one to own while you are waiting. Mors was wearing an orange one in his "Snow Eating" video. From what I have heard, Mors and IAWoodsman gave that knife a big thumbs up! longhunter, mainewoods, zachgertz and 4 others like this. I emailed him too, about 3 months ago no reply. Personally. I am at the point where if it's more then 6 weeks 8weeks tops. I'm not interested anymore. Just my personal opinion and willlinfness to wait on any knife. VanGo, NCLivingBrit and Mr. Tettnanger like this. I just received delivery of mine about a month ago. I waited 3-1/2 years. Schmittie, John jr and Mr. Tettnanger like this. Not trying to be a d!ckhe@d here, but why on earth would anyone wait 3-4 years to get a knife? There doesn't seem to be anything special about them, from a materials or profile standpoint. I recently dropped a deposit on a blade that will be 10-12 months in the making, and I was questioning my own sanity for that one, so I'm really at a loss to understand what could possibly be worth waiting several years longer for. Is there something special I'm missing? NCLivingBrit, caoutdoorsman, Roughneck75 and 2 others like this. Is there something special I'm missing? I think some guy named Mors said it was cool. Monzur Haque, Thunderwood and BC-Medic like this. Ogive, Northwoods21, praharin and 9 others like this. I recently dropped a deposit on a blade that will be 10-12 months in the making. No deposit needed when placing an order for a Skookum. mainewoods, Crane, rsnurkle and 2 others like this. Have you ever used one? Furthermore, I sent Rod an email with my order, no deposit. 3-1/2 years later he contacted me and said they were ready. What is so horrible about that? Crane, geologist2, John jr and 3 others like this. Better off to just get one on the trade blanket or watch out for one on bladeforums. you'll pay a 100% markup for your impatience. roadwarrior, zman9mm, x39 and 3 others like this. It's a "want" not a "need" for the buyers of the SBT. They want to own one and don't mind waiting. It's not like they are sitting home waiting the 3 or 4 years to receive their knife so they can actually now go out and practice bushcraft. Collectors don't mind waiting for something they want. If this were only about "needs" then we would all have a Mora Companion (or similar). As far as the feel of the knife, well we all have different hands and what's comfortable to some might not be comfortable to others. The SBT felt great in the hand (got to feel one Dude Mclean had) but no better than the BCNW-01 (amazing feeling knife) nor better than a Woodbear Karhu nor better than the Lagom Bush Knife (designed by bens backwoods and lester river bushcraft) my new favorite, which Mors really liked as well. The handle shape of all those knives fit my hand like they were molded for me, however they may not (including the SBT) feel great for you. Waiting that long for a custom knife is not the norm, however, Mr. Garcia is not the only maker with a 3+ year waiting list. Medicine maker, mainewoods, Dm1995 and 3 others like this. I am not sure of the wait but he will get back to you. It may take a while but he did get back to me in about a month or so. I emailed in January and was added to the list this year. Mr Garcia informed me it is a 30 month wait currently. I'm excited for sure. And, keep your eyes on the secondary market. I just got one this week! ArmyMacE, Pharmer, rsnurkle and 2 others like this. What color and type of micarta is your skookum? Nope, never even seen one. Nobody said it was horrible though, I was merely asking why anyone would wait that long for what appears to be a pretty standard knife. I came thisclose to not ordering the WC Master Woodsman because the lead time on that was up to 1 year. I was just curious to know what might make this knife worth 3-4 times the wait. Do me a favor. Go to his website and order one. No money down, no deposit, nothing. In 3 years or so he will contact you and send you the total, which will be $240. If you love it, awesome. If you hate it you can sell it for $400. What is not to love? C Bryant, kahuana, zachgertz and 4 others like this. This one is O1 and red linen. I am just patiently waiting for mine. I have all my specs picked out and when the call comes in it will be party time. Out of all the things I collect, knives are by far my favorite. b-ski and Schmittie like this. Just answering your question of why to wait on a Skookum. It is a win/win. hugasibe, Bax 40 and yourboringfriend like this. There is no way I'd wait three years for any stinking knife, my Bear Grylls will cut anything a custom will. Fixedblade, americanstrat98, Mr. Tettnanger and 1 other person like this. And it will do it with style, grace, and GUSTO! Finally somebody with some darn sense around here geez. I waited three years for my third birthday I can't go through that again! operatord, nwbowhunter, Fixedblade and 5 others like this. This thread has got me thinking. I can put my order in now, then every month I'll put $10 in an envelope and by the time he calls me, I'll be good to go, and then some. Generally one wouldnt go to a wait list forum to spark an interest in a custom, but hey, that just happened. Guess I'll get back on here in a couple years with a new sbt!! BetterNotBitterIsSurvival, NattyBo, x39 and 2 others like this. Good thinking! Fact is, you'll probably have enough of an overage that you can be a hero and take your wife or girlfriend out to dinner, putting to rest any possible criticism on the home front in the bargain! geologist2, zachgertz, americanstrat98 and 1 other person like this. throw in a few more bucks each week, and you'll be able to take your wife and your girlfriend out to dinner. not at the same time, though, or you'll have to start saving a lot more each month (and you'd still wind up hawking the SBT off to pay for the lawyers). BetterNotBitterIsSurvival, praharin, americanstrat98 and 2 others like this. I've tried it out and it is simply outstanding. The handle is a little meatier than my SBT but that isn't a detractor for me. I did a Gauntlet review of his prototype Bushtool that you can find here. There is also a REALLY good writeup of two Blackfeather knives (including the Bushtool) in the latest issue of American Survival Guide. FIELDCRAFTLTC, House of Horst, Mattexian and 6 others like this. Thats good to hear, when I ordered my knife he said it was 45 months. That was in April of 2014. I have had the knife an it was great blade marvelous! FIELDCRAFTLTC, outfront19 and Mr. Tettnanger like this. I waited three years for my third birthday I can't go through that again! Yeah but what about your second birthday? You doubled your age (from 1 to 2) in a one year period! Let's see you do that again! rb40 and x39 like this. In that amount of time you could become a Master Smith and build your own awesome knife. Whiskey River and caoutdoorsman like this. Wife: What is that coffee can with SBT on it for? Me: I'm saving for a Skookum Bush Tool. Wife: What is a Skookum Bush Tool? Me: It takes 3 years of waiting to get one. Wife: How much do you have saved up? Me: Enough to buy a Bear Grylls knife at Walmart. Wife: I'm going to Walmart, want to go? BillO1s, Whiskey River, x39 and 5 others like this. Is this a convex edge? Phenomenal looking knife. If I wasnt so close to getting my SBT, I would definitely get it. I just do not like having to many of the same type knives. "This product is available for pre-order only." I have been eyeing the rustic brown version! These are made by Bark River. They are on closeout at Knives ship free. I knew who made them. I wonder if production is going to end. I believe they are done, all AKC knives are in the closeout section. Does anyone know the email for rob Garcia ? I just tried to order the knives but it bounced back ? Thanks. I have been personally hassling Mr. Garcia about his email response time. Every once in a while he does look at his email and adds names to his list. He is slow but he is still dedicated to the task of creating a kickass bush tool. I waited a while for my current SBT and once my wife held one of Rod's knives again she told we could not get rid it, and I agree. I make knives and once we got our SBT I decided there was no reason to create a personal bush tool as the SBT is so perfect, said that last part just to inflate you head if you are reading this Rod, but it's true.